Kevin Keatts’ excellently-coached NC State Wolfpack, playing without its team leader, PG Markell Johnson, the reigning ACC assists leader, battered U of L on the backboards, 38-26, overcame a ten point Cardinal lead in the 1st (hitting 11/12 FGs in one stretch), then did it again in the second, and in a tight game held U of L without a FG for the last 4:18 of action. U of L’s steady as he goes engine, Dwayne Sutton, sputtered for most of the game, got in foul trouble early and was only on the hardwood for 23 minutes, grabbing but two boards, and turning it over four times. Jordan Nwora, of whom Cardinal fans had started worrying about a jump to the next level, slipped back to the norm, missing all 7 of his longball attempts, firing up more than a few selfish shots, and lazily turned it over several times, four to be exact. The offensive funk of VJ King, but for one really aggressive score, and Darius Perry continued. The Cards coughed up the rock 15 times. Yet . . . yet . . . Louisville came out victorious in the exciting Top 25 match up, 84-77. Just how did the Cardinals do that? Well forcing 23 Wolfpack turnovers helped. Helped a lot. Defense, be thy name. Converting those gaffes by the visitors into 37 points, while State only tallied 13 on the Cards’ errors was, you know, nice. +24 in Points off Turnovers = Huge. Louisville was +19 at the charity stripe. Its 24/29 marksmanship mattered late especially. (Though I’m always reminded of Larry Bird’s belief that FTs in the 1st are always as important as those at the end.) NC State, continuing a recent trend, only had 7 attempts, draining 5. The foul disparity was significant: Home whistled for 12, Visitors for 23. But, sometimes the numbers don’t tell the entire tale. I have two favorite interludes. Numero Uno: The Cards led 20-10 at 11:05 of the 1st, after a Ryan McMahon trey. Then were outscored by the feisty Tobacco Roaders, 4-17, over the next five minutes plus, falling behind 24-27. Then Christen Cunningham, as I’m wont to say, grabbed the battle by the short and curlies, getting the Cards back on track. 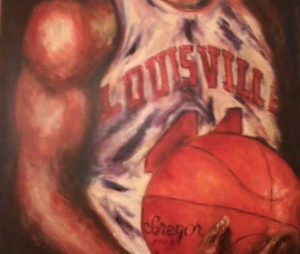 He scored eight straight for U of L. The game was still knotted at 32, but the good guys had shaken their jitters, thanks to CC’s steadying hand. Part Deux: The Cards again led by ten midway through the second, and again State fought back to tie it up. Back and forth it went. A C.J. Bryce triple pulled the Wolfpack within a deuce at 77-75 at 1:27. The Cards ran a nifty pick and roll set out of a timeout, but CC’s pass into the post was pilfered. Then, for arguably the biggest play of the game — unless it was Steven Enoch’s triple a bit earlier with an expiring shot clock for a 73-69 lead — come on down and play, Mr. I Got A Few Tricks Up My Sleeves, Ryan McMahon. Who cleverly stepped in front of Hazard, KY’s own Braxton Beverly as he attempted a rampage to the hoop with :46 to play to tie it up. The charge was drawn. Then Chris Mack’s maneuvers reminded me of . . . come on, you know . . . Denzel Crum. A slightly different configuration on the inbound against pressure got the ball to McMahon a/k/a McMoney (93% at the line), who was fouled, and, of course, drained the 1+1. 79-75. Mack then adroitly went offense/defense, replacing McMahon with smothering quick Khwan Fore. Who forced Braxton Beverly turnover. Which led to Cunningham converting another 1+1. 81-75 with :38 to play. Despite blowing two double digit leads, despite giving up 7 treys after intermission, despite being clobbered off the glass, the Cards were finally clear. There is no analytical way to quantify Will to Win. Other than, you know, the final score. 84-77 in case you forgot. I also loved Sutton’s trey to put the Cards up 70-66. Though it was answered by State just a few seconds later. Khwan Fore’s nine point, three rebound second half was sweet. Included a much needed corner trey, and that nifty pull deuce on a fast break to put U of L up 75-69. Personal Note: A shout out to the two fellows who stopped by to say hey at the break, while I was poring over the 1st half stats. Of course, because I’m an old fart, I don’t remember their names — my bad, guys — and realize in retrospect that I’ve met one of them before. It was a truly nice gesture. Thanks. The Cards are #16 in Ken Pomeroy’s rankings. And, at 5-1, remain in a tie at the top of the ACC with four other schools. Pitt comes to the Yum! on Saturday afternoon. The smell of revenge is in the air. Did you say Denny Crum? It is refreshing to see some offensive ingenuity coming out of timeouts and on in-bounds plays after years of seeing our point guard tom-tom the ball until 4 seconds are left on the clock, only to make a mad dash to the hoop for a contested, fall away layup or fire a 30 foot off balance jumper as time expired. It seems to me that our new guru has made the sum of our team’s parts much greater than they should equal. It will be interesting to see if the fresh, supposedly talented new blood we are getting next year will follow in a similar fashion. BTW….Who thinks that VJ and DPerry will still be here next year? The VJ/ DP question was also raised in the Comments section of this posting at cardchronicle.com. I think DP’s situation is just a sophomore slump, from which he will emerge. Though he’s now allowing O woes to affect D. He made two great drives to the hoop, but simply didn’t finish. Then his D went south during State’s big first half run. As my pal Doc has opined all season, it might be best for VJ to move and get a fresh start. Buuuuuut, if his attitude is as good as it is reported, despite his play, his maturity could help with all those young faces next season. I’m hoping both come out of their funk, starting, well, tomorrow against Pitt would be good. But there’s not much time left on the clock, frankly.